Nothing New Under the Wingnut Sun: A Coming Preschool Backlash? 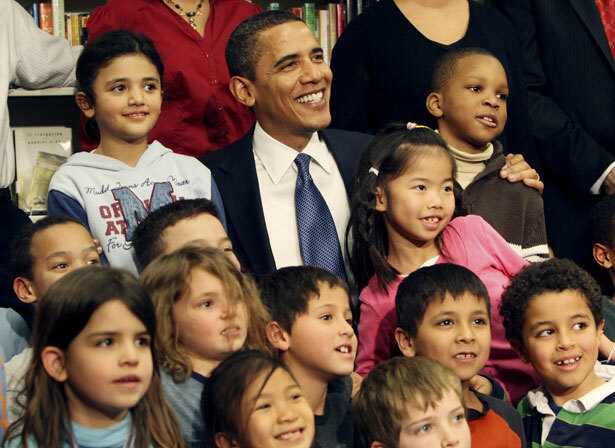 In his State of the Union, Obama naively proposed universal preschool as a conservative idea. Conservatives will not agree. The problem is, the White House might just be naïve enough to believe this is a relatively easy political sell. The breakthrough research on the payoffs to investment in “universal pre-K” was done by a Nobel Prize–winning economist named James Heckman, of the University of Chicago—and Heckman is, fundamentally, a prototypical University of Chicago economist, a neoclassicist. So it’s a “conservative,” market-based idea, right? Like cap-and-trade. Like the “individual mandate” in health insurance. So how could conservative Republicans object? Right. You see where I’m going with this. The president signaled that part of the sale when he noted two states that “make it a priority to educate our youngest children”: Georgia and Oklahoma. Said The New York Times, “Oklahoma and Georgia have Republican governors and were won by Mitt Romney in last year’s election. Both states have expanded their preschool programs in recent years.” So it is that Obama traveled to Georgia today to promote the plan. The Times then quotes an earnest liberal with one of those what-conservative-could-object observations: “‘If you look at how pre-K has grown, you can see a range of different governors supporting it,’ said Helen Blank, the director of childcare and early learning for the National Women’s Law Center. ‘We should be able to come together on something that we have clear research on.’” You know, the kind of observations that have become so familiar to us, eight seconds before the conservatives refuse to come together with Obama in any way, shape or form. The worst backlashes of these sorts are always the ones that come from perceived federal government interference with the prerogatives of the nuclear family. This is what that phrase “family values,” whose fetishization by the right is so inscrutable to us on the left (for what could better preserve family values, we say, than living wages, paid family leave and all that other stuff the “family values” right could never dream of supporting?) means to them: the prerogative of the patriarch to control his family as he wishes, absent state interference—which, even if the kludgy Obama preschool plan in actual fact will not threaten at all, it will be perceived as doing anyway, “death panel” style. The experts agreed: What could go wrong? Then came a visitation from a new political planet: the nascent “family values” right. Civilization having been preserved—for the time being—Marshner claimed credit, began making the mobilization of “little clusters of mainly…evangelical, fundamentalist Mom’s groups” her life’s work, then got a job as head the new Heritage Foundation’s education department, and was soon in Kanawha County, helping organize the textbook wars there. Mondale’s plans and Obama’s are as different as night and day: the 1971 law really did establish federal daycare centers; the Obama legislation will surely push some byzantine scheme to distance the federal money from the local implementation as much as humanly possible, insulating it from any conceivable charge he has in mind Maoist-style mind-control camps for 3-year-olds. So, home free, right? Well, if you believe that, I’ve got an Obama death panel to sell you right here. And a contraception exemption for religious employers. I dearly, dearly hope the White House has anticipated that backlash this time, and has figured it into their political plans. If not, that’s political malpractice from them. The battle over education rages at all levels: Rick Perlstein last wrote about the long history of book-banning in this country.